This tool in not available anymore. 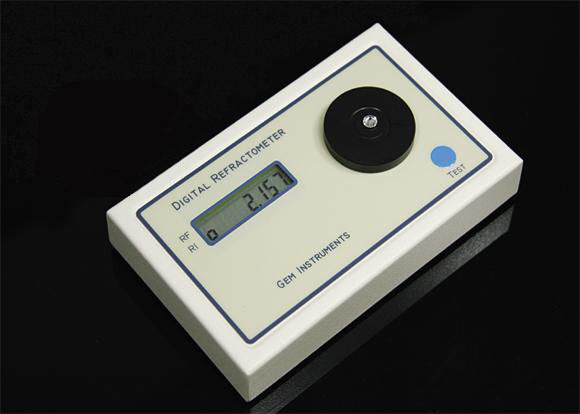 is a self-contained instrument for measuring the refractive index of faceted gem stones, covering the full range from 1.450 to 2.999 and requiring no contact liquid. 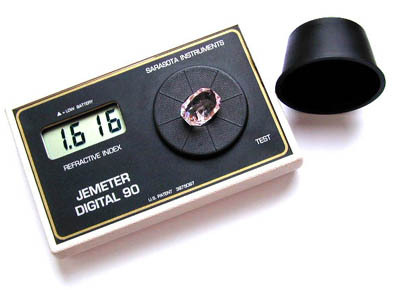 The Jemeter is calibrated to display Refractive Indices at the sodium "D" line at 589.3 nm as found in most reference charts. Due to the infrared light source, however, the test results may vary slightly with those found elsewhere. Refractive index charts are included in the manual. You do not need to remove stones from most settings for testing. However, it is necessary that the facet be flat against the test disc, without interference from the setting. The examination disc measures 3mm or 1/8 inch. Please note that in some cases you need to measure more than one facet. Test results in comparison with a traditionel refractometer.